Article marketing is powerful and effective. Article marketing can also take many forms. Blogging, submitting articles to other sites, email marketing and writing short reports are all article marketing. Writing but a few articles a week can lay the foundation for a very powerful, and profitable, online business. I can think of a dozen well-known marketers who started online exactly that way. They began with article marketing and discovered an audience who liked them, trusted them and bought from them. They went on to create their own products and build their online empires. These are names you would know. If it happened for them I believe it can happen for you too. But HOW do you write a great and helpful article if you are not a “writer.” That’s the question I get a lot. So I’m going to answer it here. Here is the formula I use to write articles. Before we get to the “how to” let me say that this is but one of many proven models for writing articles. I personally rotate between about five article writing models (or templates) to keep things interesting for me and for you, my readers. Of all those models this one is the easiest to use and the most pleasant for the reader of your article. This article writing formula helps you help people, and helping people is what article marketing is all about. When you approach article marketing this way — with a true desire to help — reciprocity will work for you and you will be rewarded for your efforts without having to resort to hype or high pressure sales tactics. You are going to write a “how to article” that gives the reader three or five steps to take to accomplish a task. This is a lot like a recipe. If you can teach your daughter to scramble eggs or teach your grandson to shoot a basketball then you can do this with no problem. You just need a little practice. When you teach your kids how to do things you break the task down into tiny steps, baby steps, and make sure each step is clear and easy to do. That is what you will be doing here as well. So get in your mind something you can tell a reader to do with three or five simple actions. If you can’t think of something now no problem. You can come back to this article when you have your idea. In my next article I’m going to share how to generate an endless stream of ideas so no worries. Your article is going to have the following structure. Let’s look at the structure and then I will share for a moment about each item. This overview assumes a five point article. Paragraph 1 – Define the problem. That’s it! Simple, clean and effective. One thing you need to remember is this. When writing for the Internet you need to keep your paragraph length short. Let me give you a very brief sample. This is the template that I have used for writing my “Solve Your Traffic Problem Today!” article. The sample below are my notes, not the finished article. To see these notes in action, you can read that article here. Let’s say you want to write an article about how to get more traffic to a website. And let’s say you are making the case that the reader should buy this super duper traffic course you are promoting. How do you do that without high pressure selling? We all need traffic but there is so much information out there that it becomes overwhelming and expensive. People are suffering from information overload. You could waste time and money experimenting and you might find something that works. Or you might lose all your money. You could just do pay per click or buy a solo ad or put an ad on Facebook. But there are risks. A better way is to model someone who has “been there and done that.” Someone you can trust and who will help you. Take these steps in researching solutions. Who are the leaders in the “getting traffic” field. Can you afford to do what they teach you to do? Does what they are proposing make sense to you? Will you take action on what they suggest? If you find someone you can trust who has a proven model for getting traffic and you can afford to use what they suggest and will take action there is every reason to believe it will work for you. Make a list of the different ways to get traffic to a website and choose one that interests you most. Possibly include the list in the article. I will write THAT article in the next few days and send it along so you can see what the finished product looks like. For now YOUR action step is this – think about things you can teach people to do in three or five short steps. It might be getting traffic to a website or it might be baking a cake. Doesn’t matter really — the process is what’s important. Once you learn the process you will be able to write articles quickly from your own experience or from your observations or research. You will be an article writing machine! There you have it. I have written literally over 1000 articles using this very formula. It works for me and I believe it can work for you too. Article marketing changed my life and helped me build a strong online business that created both financial and time freedom. I want that for you too. Because freedom is a beautiful thing indeed! Thank you Camilla. I appreciate your kind words. This guide is actually very helpful to me. I have read many of your articles and to me you write some of the best copy of anyone I have seen in years of reading articles online. Now you are showing myself and others how to do what you have been so successful at doing. Thank you so much for this free lesson. Excuse me.. I have to go write some articles. Thank you for your kind words. I look forward to reading your articles! Great writing Charlie. I find writing articles quite difficult although I know that construction and placement of good words and phrases can go a long way in determining the success of a marketing campaign. I know that I have to be careful with my words but it doesn’t get easier. I like your information, it’s short & informative. I don’t think I’m in the DOE Member? I’m re-doing my website & putting a new product on it; is it a good idea to use the Article Marketing (like putting 5 reasons to look at more info. on my Home page or is it the best idea to put more info. on my Home page to let people know what I’m sharing? Thanks! That decision has to do with what your gaol is for the home page. If it is to sell products today then feature your best offer. If it is to build a list and sell products that way (which I do recommend) then make the case for why they should subscribe to your list and use the messages sent to the list to both teach and make appropriate offers. Hope this helps. Thanks Charlie. I have only been reading your blog for a week or so but have been going through your archives and eagerly devoured your help and tips. I have had problems focussing on the most important tasks mainly because of information overload. I research and research but have not been producing enough content of my own. Your posts have motivated me to concentrate on what is important and in the last 3 days I have published my first info product and written an article and 3 blog posts. As you can see I have also got back into blog commenting which served me very well in the past but something I have been neglecting. Excellent progress! I’m so glad you are here. 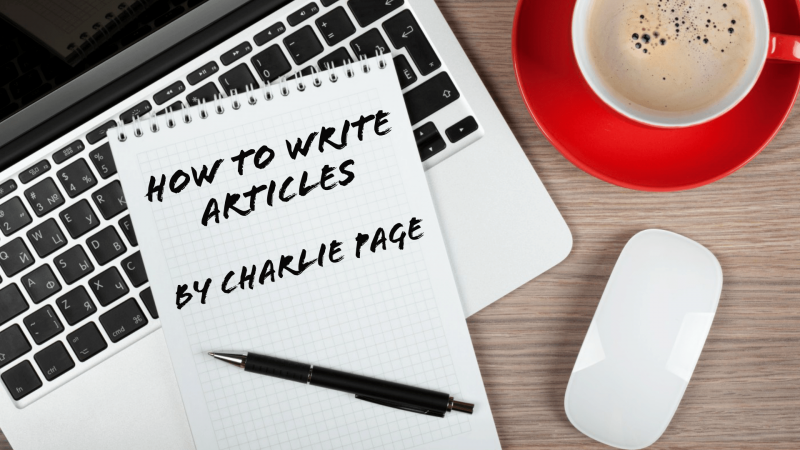 Charlie, I have found my own way of writing an article to combine with the steps you outlined can get to be fairly easy and fun. I like to find a YouTube video that is relevant to my product,watch it a couple of times and then write about what I just saw in my own words. It may sound odd at first but I find it works for me. I make notes and a basic outline and in a few minutes the words come easy and in my own “voice”. Just thought it might help someone who can’t seem to find the word for their first few articles. I love this site Charlie and thank you. I really like the idea of using this formula, it helps to break down the things you want to say to the readers instead of having your readers trying to figure out what you are trying to tell them until they have read the entire article. Thanks, I really appreciate this! Thank for the Nice, post and really believe in the formula you share. I definately gonna share it with my Face book friend, as I personally also believe in article marketing, but a have one problem as I am not a Native english speaker. I am discourage by the time I spend to do a research and write articles only to get them fail due to some spelling and grammar errors 2 to 4 times before they get published by ezine articles for example. There are many grammar checkers online that might help. Here is one http://www.grammarly.com There are others, both free and paid, that work quite well. Thank you for your tips about writing articles. This is something I can improve. The structure you gave is very helpful for me to write articles. Thanks for this very simple method. I tend to over-complicate things, and imagine they are biiger than I can manage… so I avoid doing them. But what you ahve outlined here couldn’t be simpler. I’m going to look out for your demo article, then see if I can produce one for myself. As always I enjoy your insights and integrity. I’m one that does not care for hype also, and when a product launch takes place on the internet, most top marketers band together and the hype begins. What might your view be on – to hype or not to hype? Thanks for helping so many with your honesty! Charlie this letter is really great simple instructions, easy to follow and written so a layman like me can unbderstand. Your write ups are renewed always. new ideas and courage to move on. I’m happy you find them helpful. That is my goal. Thank you very much for making look easy, never liked writing because my limited skills, but I sure want to give this a try. I hope it works out for you. Once you get the hang of it it’s quite easy. Thank you for the tips re how to write articles. It sound easy but I still find it hard to do by myself. Until now I did not make any money yet online. Found a lot of visitor on my website but I do not know how to make from my website. The article was done by somebody from my web host. Do you have any idea or advise on how I can make money from my website? Thank you. I am one of your DOE member. Lanny = Log in to DOE and give me the URL so I can take a look for you and suggest some ideas. But please do it there as this sort of consulting is for members only. I will be happy to help if I can. Can you share with us these other er models you use? I’m sorry but those are for members of my Article Marketing Live site. They paid to get the full story so I can’t give on my blog what I sold to them and stay in integrity. Hope you understand why. That’s a high compliment. Thank you for opening and reading my emails. If you are getting real traffic there has to be a way to turn that into money. If you are a DOE member log in and submit a consulting ticket and let’s get to work on that. strategies that are easy to read and understand.. I look forward to working with you. I like what you have done with the DOE. It’s great. I’m still trying to learn how to make a post to my blog. It’s hard to keep coming up with things to write about. Happy to help. I have an article coming soon about how to generate article ideas. I hope you find it helpful. If I keep following Charlie, then one day I’ll be as savvy as he is. But, here’s something I do: I visit good blogs like Charlie’s, and I read through the comments after the article. I also belong to several IM Forums. What I’m getting at here is: Some questions in your niche are common. Pick some of the most asked questions (or even the most interesting – things that would help your readers), and write an article around that question(s). Hi Charlie I have wrote articles and published them on ezines articles. I don’t think they have had any great impact for me so far. I like your process and will start implementing it straight away, because I know how good you are at writing articles. I hope I can be as good as you some day and build plenty of successful article marketing campaigns. All it takes is practice and persistence. Putting your articles on EzineArticles.com alone won’t get the job of marketing done in my view. It’s a great site but there are SO many articles that it’s easy for your articles, or mine, to get lost. A blog of your own is essential in today’s world in my view. Thank you Charlie for your valuable advice and tips. You make it sound so easy. All the best to you! Inch by inch it’s a cinch! Doing one step at a time really is the only way. But there are still things to learn and challenges to overcome, no question there. I know you can do it. Thanks for another valuable article. It is good to use a template to create one’s articles. I find it good to follow a guide where samples are shown, as you have done in this article, as this really helps me to write a proper article. Thanks. It will be out very soon. You’ve inspired me to write. It’s always daunting before beginning something. I’m from Geelong in Australia and I have been a member now at DOE for about 2 years now and in my opinion its the best membership I have ever signed up to. Thank for all your help. Thank you for your kind words about DOE. We really work hard to provide value so it’s nice to hear we are helping you. Good for you writing! The more you do the better the final product and the easier the effort. Thanks Charlie you have the power to make life easier for others with the work you love. Thanks for sharing. It is a pleasure to read your articles, gives a fresh air across the ocean, from Barcelona, Spain thank you very much. Glad you liked it! I’d love to visit Spain someday. Beautiful there from what I hear. Thanks for this input, Charlie. I like the idea of using a template – and it is most helpful to have an example of exactly the type if thing to discuss in each paragraph. Foe those like me who struggle to think of what to write, this does a lot to help. Keep it up. I enjoy receiving your emails with good advice. I just got around to updating that yesterday. Thanks for noticing. I’m glad you find the template helpful. It is there for the taking for those who have a solid plan and take action. The Internet is the great equalizer. I’m happy you like the posts. I recently wrote an article titled ” 7 reasons why the World is Turning to Custard.” Could have made it 10, 12 or more reasons but wanted to keep it brief. Look forward to receiving your finished article. Good idea. You can always publish a part 2 to your article if you want to use those other parts. Hi Charlie, Excellent tips. I wrote more than ten articles and published them in ezine articles, but I didn’t have much success. Now I will try the method you explained. By the way, can one article be published in many ezines? In many ezines yes. That’s the beauty of having ezines run your articles — because ezines are delivered via email there are no duplicate content penalties as there are on websites. Nice explanation. I write professionally so never stopped to consider what it is that I do, but that is pretty well my process. Along with three decades of sales experience of course. Wow – we sound like twins. You seem to make it so easy but I am daunted with the task. I have tried but it wont come off. However, if someone else writes the article, I can edit it (pull it, pinch it, tweak it and perfect it) very well. I just don’t know how and where to start and what to say. I am a complete ignoramus. But, if you put the meat in front of me I will carve it beautifully and make presentable or a masterpiece as some may call it. If you can edit you can write. You need to get rid of the limiting thought that you can’t do it and fill in the blanks from the template I shared. Practice with any topic for which you have knowledge. Thank you for streamlining your process in simple, easy steps. Very good advice for anyone, and a nice refresher for those of us who write. So glad you found it useful. Thanks. Awesome Tips Charlie! Never tries Article Writing this way so far. This formula sounds wonderful and I am going to try it. Thanks a lot! It’s a real time saver. Glad you like it. Nice one you have there, for me there us one thing I do and it is working for me. If I have say 2hrs to write, I send atleast 1hr making research. This have proven to be one of the best methods, I wonder if it works for you. Research is indeed important. I like to research for a longer time, create article titles, prioritize that list and then begin writing. We all have our own process, which is part of what makes it fun. Wow, Charlie. Love this article – as I do love all your work. Thankyou so much. I will take your suggestions on board. Must away to write an article!! Let me know how it goes. I’m happy you found it helpful. Hi Charlie, excellent job on this article. I love the steps or tips approach with article marketing. I almost use this template way to much. My last article I submitted was titled “7 Easy Steps for a Leak Free Outside Sill Faucet in 10 Minutes or Less”. The problem I have with this type of template is that I set a goal for 400 to 500 word article. I always go way over because I maybe over explaining each step. There are three things you can try. Use fewer steps (like 3) and have your resource box link to where they can read the other 4 steps. Or shorten the tips. Or make the article a two-part series and point them to part 2 in the article summary. Also, nothing wrong with 900 word articles. My average article is about 1200. Hope this helps. Really cool! Yes, I really enjoy writing articles that can be broken down into bullet point steps and is an easy way to think of ideas for new articles as you go along. I also find it really useful to do bullet point “tips” or “ideas” that could potentially go in any order. That way you could come up with a whole set of tips that would make perfect sense in whatever order you put them in and be able to easily re-use the same snippets or bullet point ideas for numerous other articles. And then you can make bullet points of the bullet points for an unlimited stream of article ideas! Just wondering, if these 3 to 5 step style articles are primarily for search engine traffic (from your own blog? directories?) or for syndicating to ezines/blogs with an existing readership? At the moment I am relying on search engine traffic for content I create, but am interested in having articles syndicated to ezines, but many of the ezines I subscribe to in the internet marketing niche tend to be primarily for solo ads and I don’t see much guest articles pop up. I never write for search engines but I do get a considerable amount of search engine traffic. I only write for people, so the articles are mostly for my ezine and my blogs. In niches other than Internet marketing I use a lot of these 5 point articles for easy, but useful, content. Getting ezines to run your articles is harder than it used to be but still very profitable. The key is to make a personal approach, not try to automate or “blast” the article out to thousands of ezines. So I think less syndication and more relationship. Thank you for this article and looking forward to the finished product. Glad that Belin is doing well. Thank you for thinking of him. He is doing well. I’ll have that sample article in the next few days. I’ve just been made a Diamond author at EZA, with over 100 articles there. One of the best things I did was to buy Dragon Naturally Speking. Now I just talk conversationally, and can finish writing an article very quickly. You can get to 500 words in about a minute! Congratulations! I use Dragon as well and it is really a time saver. I like the process of typing so still type most of my articles but Dragon is great when time is pressed. This is a great post. Cannot wait to see your finished article. The only issue I have, if it is, is whether our article titles would be “How to….” format or whether we should use more catchy headlines. I always read your emails, I am a member of DOE and I appreciate your kindly and wise advice. Live long and prosper, Charlie. Thanks Martin. It sure is good to be in front of a keyboard again! Appreciate the kind words. Your email could not have come at a better time as I have been intending to write an article since this morning. Glad to learn that Belin is doing well. Thanks Jack. Hope you like the formula and thank you so much for the prayers. Hi Charlie, I agree that article writing can be powerful. I think that we get better at it each time that we write one. I think the real key is what you said about ‘developing an audience’ – without this audience it is not possible to do a whole lot. With an audience you can find all the support you need – provided you can keep the audience and even grow it. Article writing can be powerful. I am also looking forward to trying the new DOE out when I get a chance. I would like to talk with you more about how to use it properly. Do you still have the question and answer function you used to have for members? I think it was on Wednesdays or something like that? I believe if you write high quality articles and set up a small amount of automation your audience will find you. I answer DOE member questions every day inside the new members’ area and have webinars where I answer questions as well. Hope to see you in there. awesome Charlie! I need to get in there and start making use of my membership. You shine even brighter these days, good sir! My faithful friend! Your face was in my mind as I wrote this. Thank you for your kind words. I hope you are well. Great article Charlie!….this is something that I struggle with, hopefully this will help. I hope it does. It works well for me and for my Article Marketing Live members too. Thank you so much for this simple solution! I love it! It’s very clear and came at the perfect time. You can really use this format for any topic – I’m keeping it handy, thank you! I love this formula and use it all the time. I just finished drafting the sample article I will publish soon and it took mere moments compared to the hours I remember staring at that darned blank page before I started using a template. Glad you enjoyed it.